As I walked the lawns of the Hofburg, the dazzling palace of the Hapsburg emperors, my eyes were drawn to a group of hippie types smoking, quite openly, a few exquisitely colored and shaped Bongs. Being a Bong myself (and a great one at that), I naturally stopped to admire. A little context. Our conference was being held in Baden (not to be confused with Baden Baden…that’s in Germany), the pleasure retreat of a few of the dudes who habitated the Hofburg and one afternoon, I sneaked away after the bluster and verbiage to do some site-seeing in Vienna or as the locals call it Wien. Not having a guide book and also not having much time, I just wandered around the Opera House and the lawns on the Hofburg, marveling at its grandeur and its manicured lawns (where the Bong smoking was going on). Only later did I realize that for a long time what I had been enraptured by was only the backside of the palace——feeling quite like a fool I then wended my way to the front side. 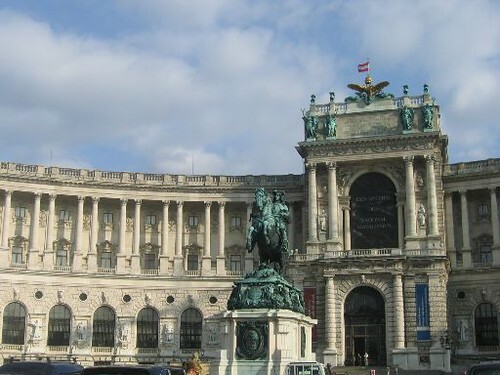 Boy oh boy –all I can say is that Hofburg is no JLo— the front is much more magnificent than the back. Brought back to reality by the mundane familiar ugliness of the word, I saw two burly desis shouting at each other in a very unMozart-like cadence——obviously two employees of a Indian restaurant very near the garden gates. Very close by was another Sher-e-Punjab and as I cast my eyes around I saw that the palace of the Hapsburgs and its classical Western European aura of orgiastic yet refined extravagance has been worn away by the depredations wrought by two of the world’s greatest cultural imperialists—India and America. Starbucks and McDonalds rub shoulders with the India Mahal and Taste of India and as I glanced at the menu of one of these Indian places, I heard not the strains of Brahms or Strauss but an instrumental version of “Taal Se Taal” . No such relief on the telly though. The top song on the TV stations of the nerve center of classical Western musical tradition was “Don’t cha wish your girl friend was a freak like me…Don’t cha?” by the imaginatively-titled “Pussycat Dolls” (with Busta Rhymes). But my biggest surprise was seeing the prevalence of India on European TV—–a pleasant change from what we get in the US. While watching “Jalsaghar” and “Teen Kanya” was a surprising bonus, what really cracked me up was watching “Kuch Kuch Hota Hain” dubbed in German. “Rahul ist ein Ubenbrucker” coming from Kajol was simply ethereal. Only pity was that they kept the songs non-dubbed and subtitled—-what would I pay to hear a German singer start out with that nasal Sanuesque “He he he …..he he he” before “Ladki Bari Anjani Hain”. I looked into my TV guide supplied by the hotel which was in both German and English. KKHH was described as ” After losing his first wife, a man realizes that his best friend in college was the one whom he ever truly loved. A heart-warming story of …………..”. On reading this, I realized , for the first time, what a masterpiece KKHH was…….I always thought of it as a saccharine monstrosity anchored by a over-precocious girl who deserved two tight slaps. 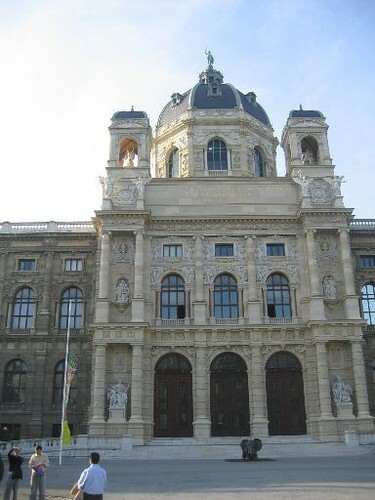 But since the uber-refined Austrians consider it a gem, who am I to argue ? Next week would be Mohabbatein–“an eternal love story” (according to the TV guide) [eternal it is…..with 5 love stories going on in parallel it does give us a glimpse into “eternity”] featuring one of the world’s most popular actors—-Shahrukh Khan. In another TV spot on “Main Hoon Na” I could make out from the German that he was being compared to Tom Cruise, Cary Grant and a few other luminaries. Of course if David Hasselhof could be God here, then why not Shahrukh? During another conference-sponsored trip to Europe in 2003, I had marveled at how intrinsicly desi Switzerland had become—signs in Hindi, Indian honeymooners posing for Patel shots ad nauseum, a desi restaurant with giant cut outs of Sunny Deol at Jungfraujoch, a special Bollywood tourist route (for Bollyphiles who want to look at exact locations where scenes from DDLJ and Chandni were shot) and an Indian couple fighting with an exasperated proprietor who was trying to explain, in vain, that in a buffet two people cannot eat from one plate. And now Austria. The day is not far off when the Opera House in downtown Vienna shall resonate with the cultural sledgehammer otherwise known as “Bollywood night” and European open air cafes shall start serving samosas and jalebis. That will also be the day Amadeus Mozart, in his nameless casket, shall wring his hands in quiet desperation and start “de-composing”. So I guess that you have the real experience (first hand) of scrutinizing JLo â€“otherwise how could you have come up with that comparison while in Hofburg? But I have a question. Is there a vast Indian population in Austria for whom the Austrian channels show the Bollywood movies? Or are they meant for Austrian population â€“ is there a solid demand for Bollywood movies by Austrian? What bothers me is that although there is a solid demand for Hollywood movies over here in India, we only get to see the backdated reruns in Star movies, AXN etc. If a small country like Austria can adhere to the market economics of demand and supply, why canâ€™t our country do the same? Of course, I know the answer â€“ it is that we donâ€™t have any option â€“ what ever is dished out to us, we gulp and never complain. Anyway, good to know that we Indians are influencing other countries (by foods, movies) besides taking their jobs away thru outsourcing. Is it bangâ€™Oâ€™li for that familiar ugly word? — Motherch**. Here guys pronounce it as â€˜aaâ€™. Or is it the amalgamation having English substitute? Well I am not sure! As far as I remember there were 4 love stories in Mohabbateinâ€” again I am not sure, I slept in second half. And yeah , please add two tight slaps of me too for that irritating â€“ Papa, main apki beti hoon ; biwi nahi- girl. of course, there were others who claimed that the ‘simplicity and lack of cynicism in your films, and those funny costumes’ was the key. go figure. @yourfan: I wish I had had first hand experiences of what you suggested…but alas I can only go by third person accounts. As to your other question, these movies are targetted towards native Austrians (hence the dubbing in German)…as a matter of fact, in my short trip to Vienna I saw no Indians on the road ! So it is not that there is a large Indian diaspora there, it is just that native Europeans suddenly have woken upto the pleasures of juveline romances and running around trees. Mohabbatein had 5 love stories—3 in the school, one between Raj Aryan and his dead gf and another between Anupam Kher and Archana Puram Singh. There was this drunk who used to stand beneath our classroom in school and shout out various bangla gaali,our sociology teacher turned that into a lesson. You are like her.You see the scope for socoilogical analysis in everything. But isok,I will not envy you anymore,I’ve always wanted to go to Innsbruck and Salzburg,not Vienna. Oh,HBO does show new movies.Like they showed Lost In Translation & Eternal Sunshine Of The Spotless Mind.That’s decent,considering they were’nt even released in Kolkata(gram kothakarer). @Srin: Well there you go….no more envy. Lost In Translation and Eternal Sunshine are small budget movies that would not really command high licensing fees to show…. A very good post, this one. I had no idea india and bollywood are so popular in europe! Dude, I’m gonna say that again…you truly are a kindred spirit. Every time I see that (insert fav vituperative stuff) of a movie called ‘KKHH’, I feel like slapping that kid so bad, it’s scary. And the part about Kumar Sanu’s nasal ‘he he he he…’ stuff…just thinking of the poor German dubbing artiste who would have to factor that in makes me double up. You have a very unique writing style. Great stuff. it is a very very good property of india. india hed avery good artiest,i love india. i proud to be indian. Superb post ……. read it for the first time today …. very observant and very humorous ……. the term “cultural sledgemhammer” is very apt for bollywood (even in the context of India). Previous Ganguly—End of the Road?